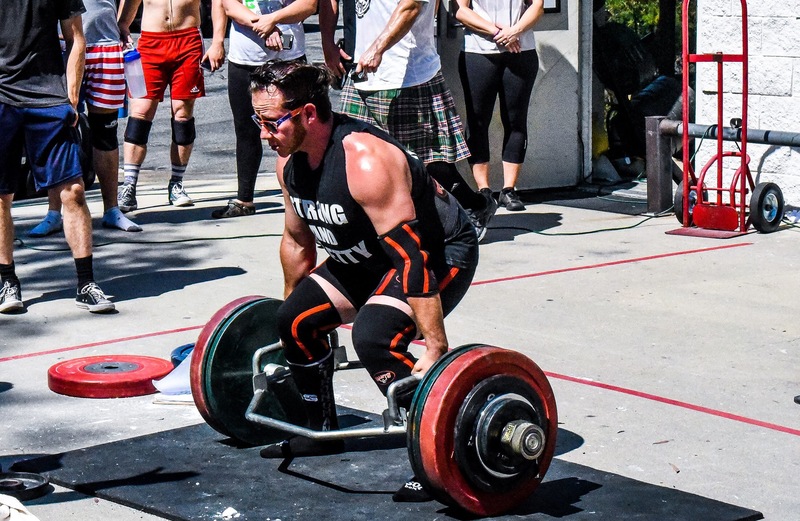 Somehow, Andrew Wickham convinced me to sign up to compete in California’s Strongest Team. promoted by Odd Haugen. So, why did I decide to compete in this contest; what was it like to complete a contest for the first time in over 3 years? First some backstory. The last time I competed was in December of 2015, I tore my bicep on the first event. This was after taking a break from high level competition, after a very poor performance at the Arnold 2014. I took time off for a few reasons, mostly recognizing that my body was a mess and I was downright abusing it. It appeared to be a good time to come back with the contest in 2015; but to be honest, I just flat out wasn’t in shape. California’s Strongest Team arrived at an optimal time, with my body feeling healthier than it has in years. 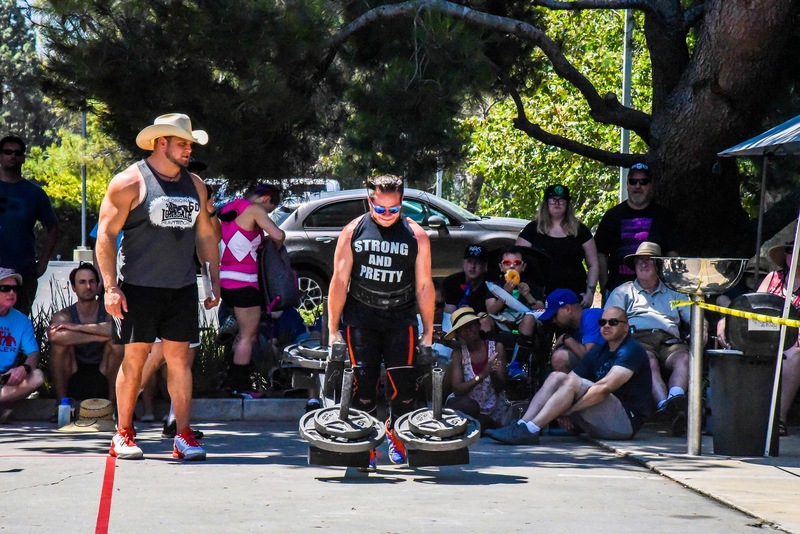 I was able to choose the events I competed in, reducing my risk of flaring up some old injuries, and I believed the team atmosphere would put less pressure on my performance. Before I keep going, I want to go on a little rant. I never retired, I frankly hate the term retirement when talking about a hobby. I didn’t retire, I just knew competing was not enjoyable to me anymore. Frankly, I wasn’t healthy enough to participate at the level I wanted to, and the lifestyle that went along with that impacted too many other factors in my life. I always said if I feel ready and a contest looked fun, I would do it. A lot of people get caught up thinking they HAVE to go to the next nationals, they HAVE to compete in the Arnold. They are great contests and great goals, but if that pursuit is taking more away from your life than giving back, you have to take a deep long look at yourself and be honest. It wasn’t fun, but I had to learn how to train without the goal of being the best in the world. To work on being healthy and correct a few years of neglect and abuse on my body was tough. I just stopped at some point and well.. Got fat again. Regaining that fire, and learning balance in my life took 3 years. The first contest back was a slap in my own face, showing I didn’t have that balance and humility yet, and that is why I tore my bicep. Competing again, and being successful was huge for me. 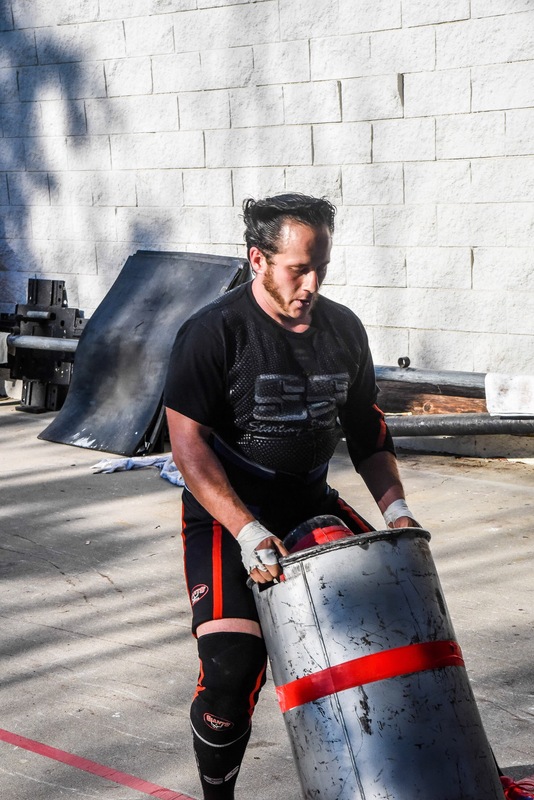 I proved a lot to myself, I can have fun doing Strongman, I can get through a contest without an injury, I can be smart and stop just a little short like a veteran. Regardless of what the score card said, this was a successful weekend for me. I can actually enjoy the sport I love again. 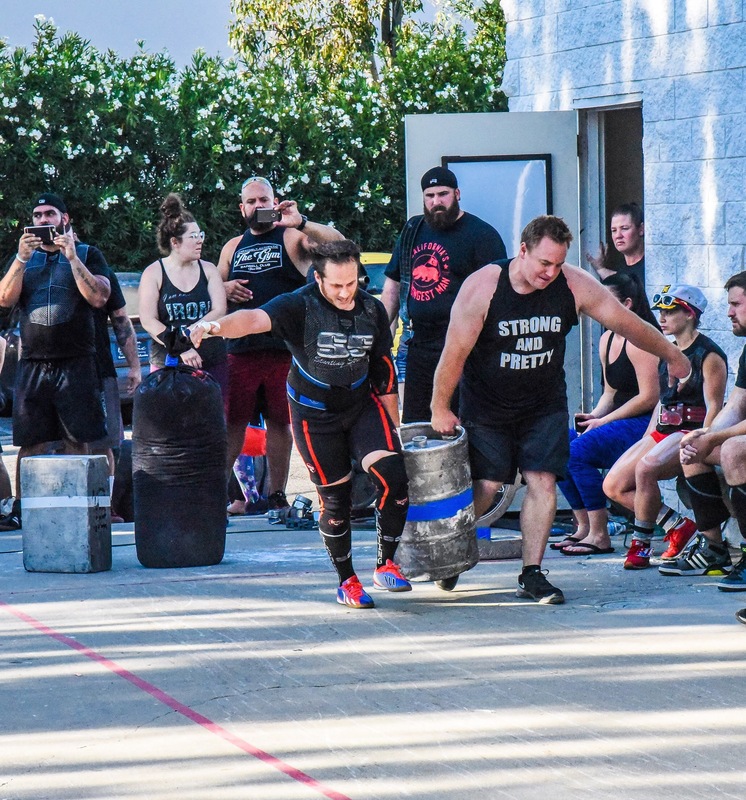 California’s Strongest Team consisted of 3 person teams, composed of at least 1 male and 1 female. Andrew asked me, so we had to find a female teammate. 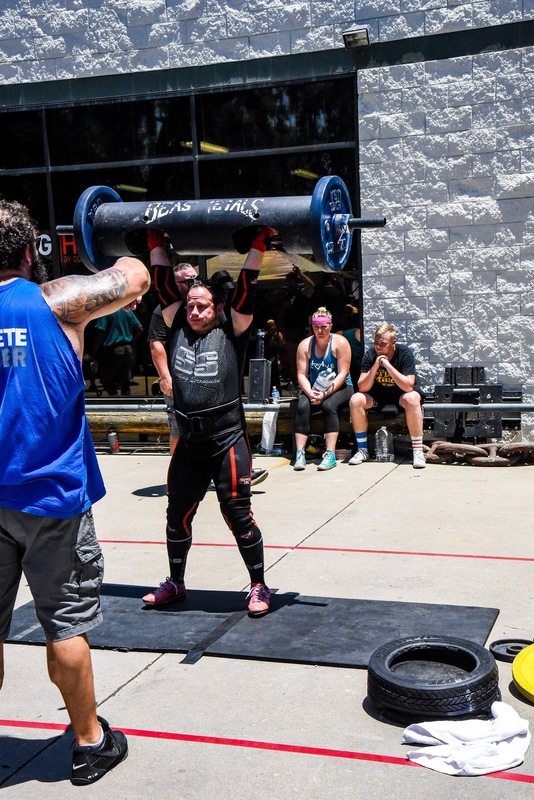 I reached out to Jane Battenfield, who won the MW class at California’s Strongest Woman in April. Our team looked pretty good on paper, all three of us having won state championships in the past. Each teammate got 1 implement to do and there was a weight chart for your class. Total reps or time was combined for each team’s score. I.E. I pressed the log 5 times, Andrew got 5 on the axle and Jane got 7 on the dumbbell our team would have scored 17 reps. I was doing the farmers walk, Jane yoke and Andrew duck walk (sorry Andrew). Due to the placing of the implements, we also decided to do it in that order to not waste time tagging each other to go next. I was a tad worried about my grip going into this, and just nervous in general, but I felt alive and I remembered why I love this. I could feel myself going into that place I know so well, where my vision narrows and senses heighten, but kept it just at bay to not become over stimulated. The handles were much easier to grip compared to the handles I use at home. I got a solid grip and went at a quick pace, a little conservative because I didn’t want to make a mistake, had a quick turn around and re-grip and my confidence boosted, so I went as fast as I could on the way back. Once I heard the down command, I jumped right over the implement, straight into tagging Jane to go on the Yoke. She had a solid run, poor Andrew was so fast on the awful 400lb duck walk, he forget to breathe and had a little mishap at the end, but finished it out on the way back. We clocked in at 1 minute 6 seconds or so for 6th or 7th place. The winning team did it in 55 seconds, and everyone else from 2-7 was within 3-4 seconds so it was very close. I chose to do the log, but in training was having some issues with the clean. If I lost strength anywhere in this down time, it’s in my legs. I haven’t had much success squatting lately and it shows. I simply was gassed and reconditioned for cleaning each rep. In hindsight, I should have done dumbbell, and Jane log as she had never trained dumbbell. My mistake there, but live and learn. I ended up with 5 reps, Andrew 5 on axle and Jane 7 on dumbbell for 17 reps; which was our worst placing of the day. 21+ would have been big points. Again, I got off easy and chose to deadlift the trap bar, Andrew got regular bar and Jane axle with wagon wheels. The weight was fairly light for all of us, but no straps were allowed which I knew would be a big factor. The most I had done in training was 2-3 reps, maybe 5 with straps. My goal was to complete at least 10 reps, but was skeptical about that expectation. Once the whistle blew, and I fell into a great groove. I completed rep 15 with maybe 10-15 seconds to go, and I could feel my callouses starting to tear. Travis Ortmayer was shouting at me to get one more, and as I went for it, I felt my hands shred from my palms down. As soon as I started pulling, I heard the down and dropped it, and was surprised by the damage to my hands. . He encouraged me to get another, but I showed him my hands. You know it is bad when a savage like Travis says “oh ok”. Then there was the torn hands aftermath of if I was going to compete again. After some medical care by Seth “Dr Meat Head”, my hands professionally wrapped by Travis Ortmayer, and somehow a drink (or two), I felt up for it. Thankfully, we were one of the last teams to go, so we got to see a lot of the other teams and picked up a lot of strategy. Basically, the setup was you have 2 minutes to move as many implements from one side to the other. Lighter implements were worth 1 point, medium 2, and heavy implements 3. 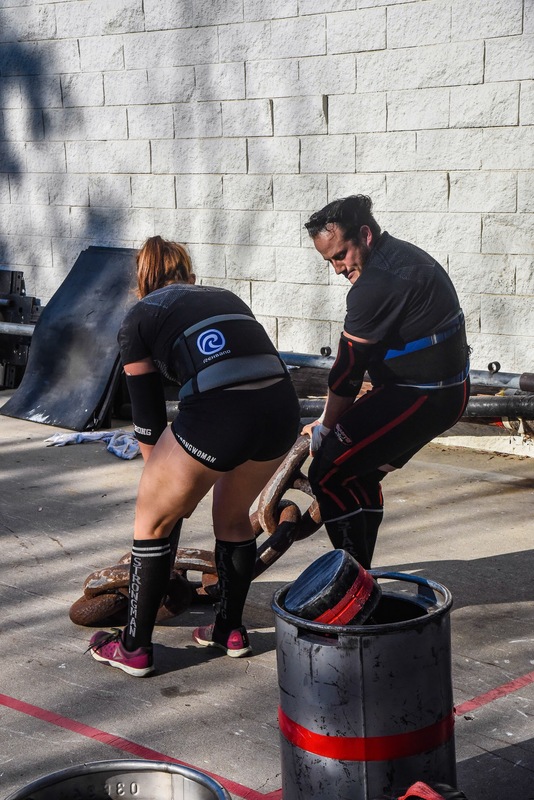 Several teams gassed themselves attempting the heavy stuff, so our strategy was to get everything light and medium maybe a couple 3 point implements together at the end, but mainly keep moving the entire time. Had we been a heavier team, we could have moved some heavier stuff (thanks Andrew), but I believe we really maximized our run. We ended up with 27 points which was another 5th or 6th place finish and finished 5th overall. 3 points out of 3rd. I couldn’t be happier with how this went, and how fun the weekend was in general,my teammates and everyone involved. ( The real writeup should be the after party) Odd Haugen and The Training Hall put on a fantastic event, and I can’t wait to do it again next year.